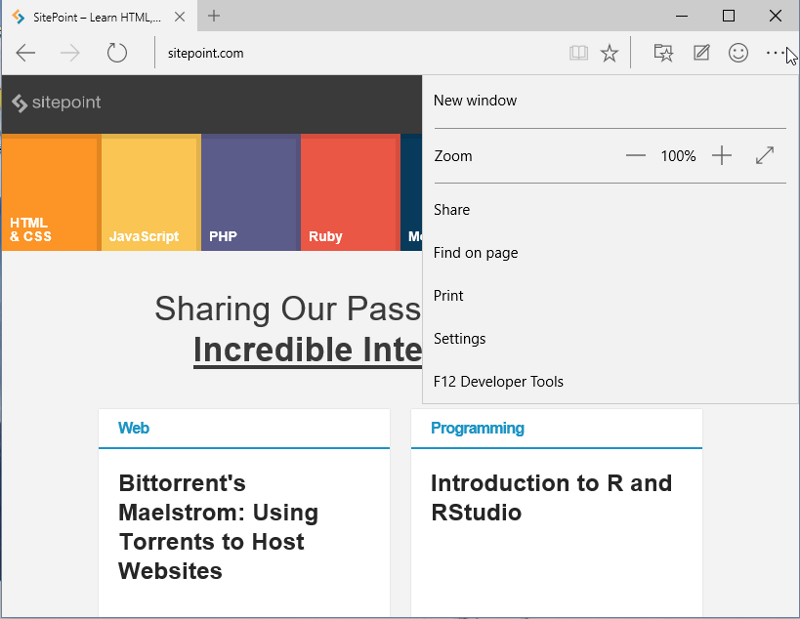 I was quite surprised when Microsoft announced that Internet Explorer — the Microsoft browser that has been around for nearly two decades — was going to be replaced by a browser then code-named Project Spartan (the browser’s final name, Microsoft Edge, was just revealed, so I’ll use that name for the rest of the article). A brand new browser (especially one developed by a behemoth like Microsoft) entering the browser market is a rare occurrence, and I could hardly wait to get my hands on it. After my Windows 10 Technical Preview installation updated itself from build 10041 to build 10049, I was pleased to find Microsoft Edge’s tile in my taskbar. In accordance with the principles of Metro – Microsoft’s design language – Microsoft Edge’s interface is minimalist, flat and very intuitive. According to Microsoft, the idea is to keep the chrome so simple that there’s hardly anything distracting users from the contents of the websites they are visiting. It didn’t take me long to get used to it, and I think the simple line-art icons serve their purpose well. Clicking on an icon that looks like an open book activates the reading view, and the web page is stripped of all ads, irrelevant images and styling. What remains is a clean and much more readable version of the web page, with large text and no distractions. The reading view can be adjusted to suit your preferences. The text size can be changed, and multiple viewing styles are available. I’m not sure if it’s a bug or a feature, but reading view was not available on all the pages I visited. Perhaps Microsoft Edge can distinguish web pages that are just collections of links from web pages that are articles or blog posts. 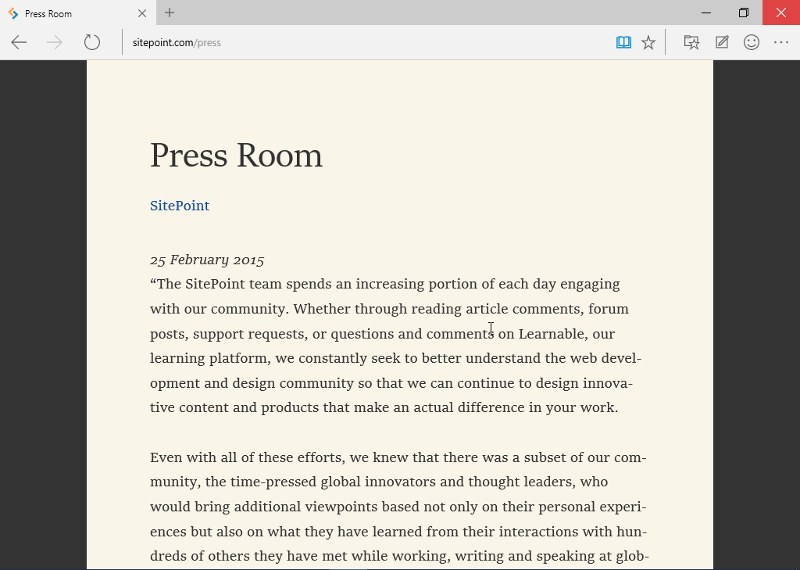 For instance, on SitePoint’s home page, the reading view icon was disabled, though it worked on SitePoint’s Press Room page. Microsoft Edge is fully integrated with Cortana, Microsoft’s personal assistant, which behaves much like Google Now or Apple’s Siri. 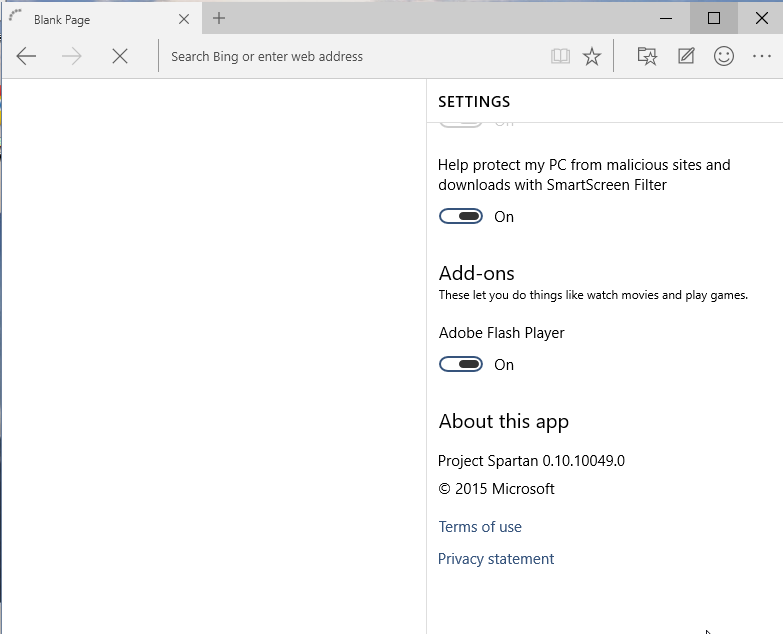 Invoking Cortana is as simple as selecting text on a web page, right-clicking, and choosing Ask Cortana. A slide out appears, showing you information relevant to what you selected. In my opinion, this is the most outstanding feature of Microsoft Edge; asking Cortana to look up the definition of a term is so much quicker than opening a new tab and using a search engine. When you bookmark a web page, you can either add it to your favorites or to your reading list. If it’s a page you’ll be visiting again and again, you might want to add it to your favorites. If you’re bookmarking it only because you want to read it later, it’s better to add it to your reading list. 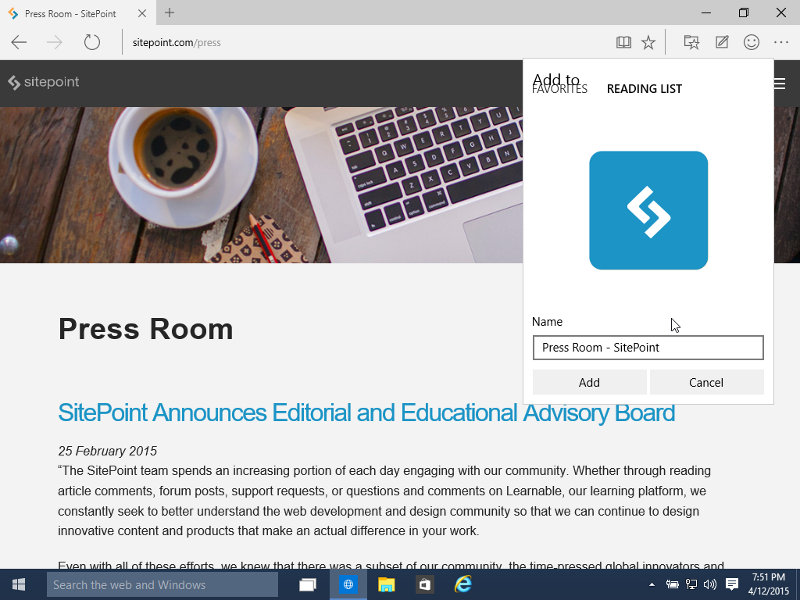 Activating Spartan’s Make a Web Note feature allows you to treat the web page you’re currently on as a page in a real book. If you have a pen tablet or a touch screen monitor (a mouse could feel too clumsy) you can doodle over the web page, highlight specific items, or even create snippets. 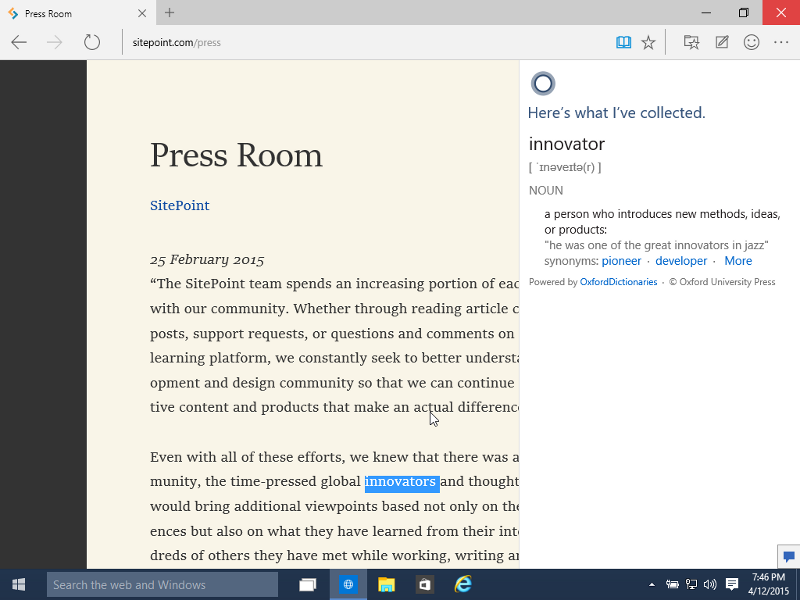 When you’re done, you can easily share it using OneNote, or add it to your reading list. 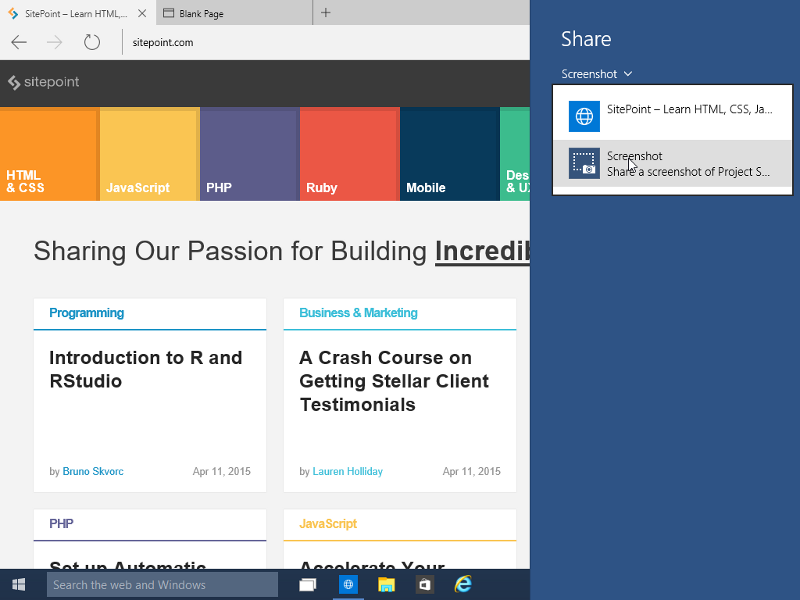 If you just want to share a link, or a screenshot of a web page, you can do that too. This made me assume that its behavior would be very close to that of Chrome. 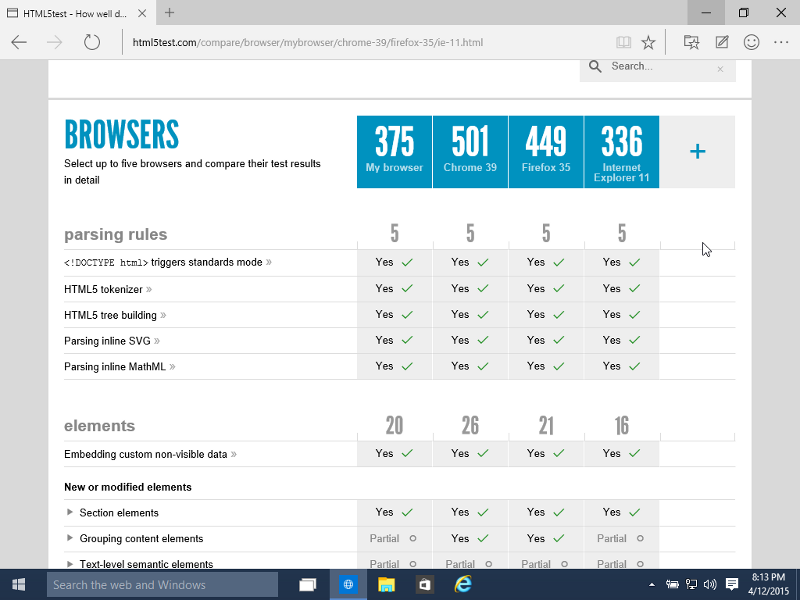 However, at the moment Microsoft Edge doesn’t seem to support HTML5 as well as Chrome does. It scores less than Mozilla Firefox too as far as HTML5 support tests are concerned. These scores will probably improve in future builds. For now, the only browser Spartan manages to beat is IE 11. 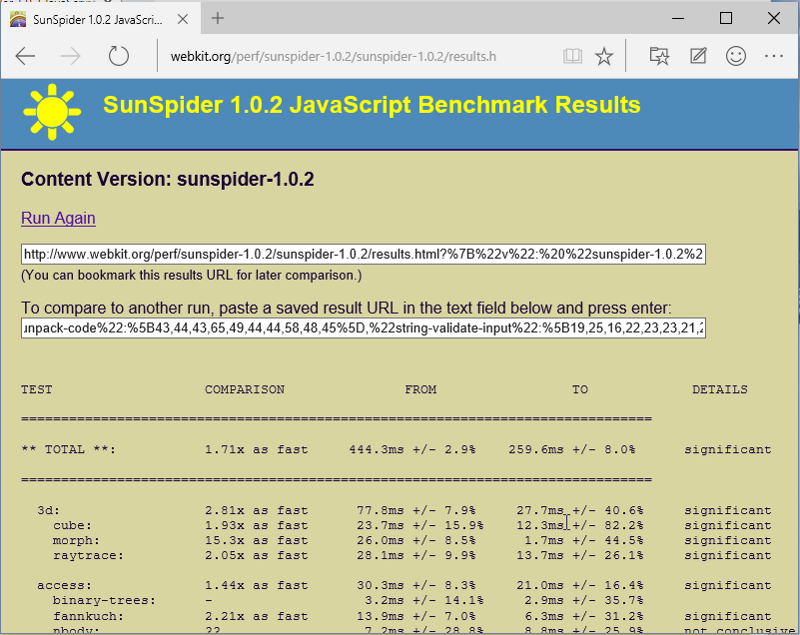 According to the SunSpider 1.0.2 benchmark results, Microsoft Edge is 1.7x faster than Google Chrome. However, results of both the Octane and V8 benchmark suites show that Google Chrome is faster. On my laptop, after several runs, Google Chrome’s average score was 13446, while Microsoft Edge’s average score was 11220. 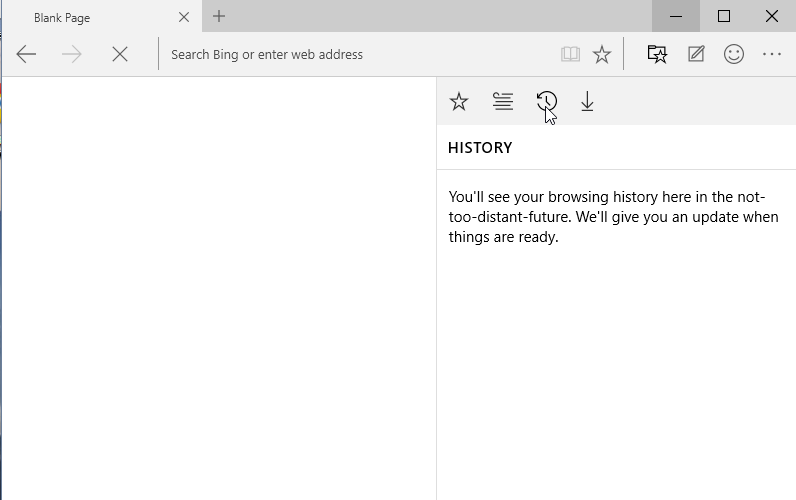 Microsoft Edge doesn’t yet display your browsing history. This feature, of course, will be added in future builds. The same can be said of the Downloads section: for now, there’s no way for you to see your download history or the progress of your downloads. At the moment, Adobe Flash Player is the only add-on available on Microsoft Edge. You can’t add new add-ons yet. Though it’s too early to compare it with popular browsers like Chrome or Firefox, Microsoft Edge definitely feels like a modern browser that can add value for users. It’s lightweight and can render complex web pages instantly. It’s very stable, too; I’ve used it for more than a week now, and not once did I see it freeze or crash. Its integration with Cortana improves the browsing experience considerably. However, it’s far from complete, and is highly likely to change significantly in the coming months. It’s best to wait for more complete builds before you decide to make Microsoft Edge your default browser. 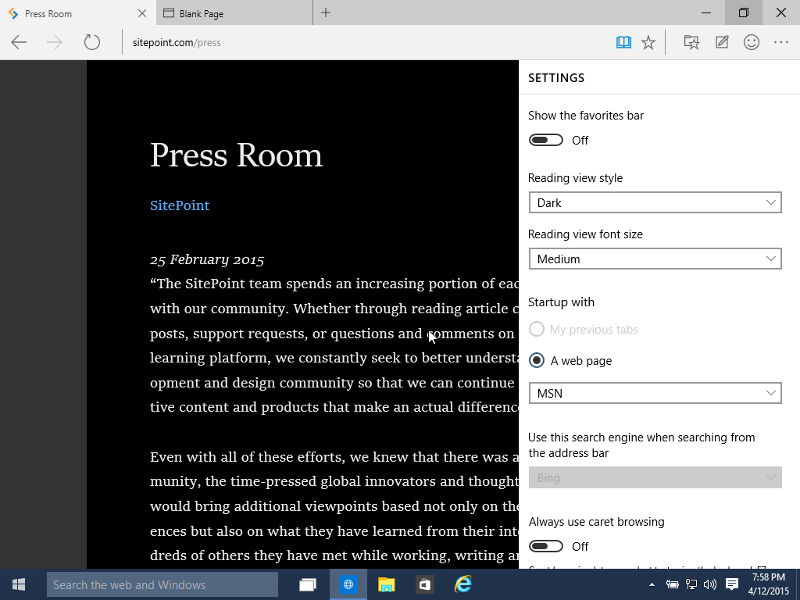 Note: This is a preview of Microsoft Edge version 0.10.10049. Does Edge include support for DNS SRV records? This is something sadly lacking in both Chrome and FF. SRV is a record type that allows a client to ask for a service in a domain and receive names of servers that can provide that service along with weighting and preference values for each of them. It is very like the way MX records work for finding mail servers. Cloud you tell me more about "Web Note" feature? Does it only save as image(screenshot)? or Save whole web page as web resources (html, css, resources and js)? 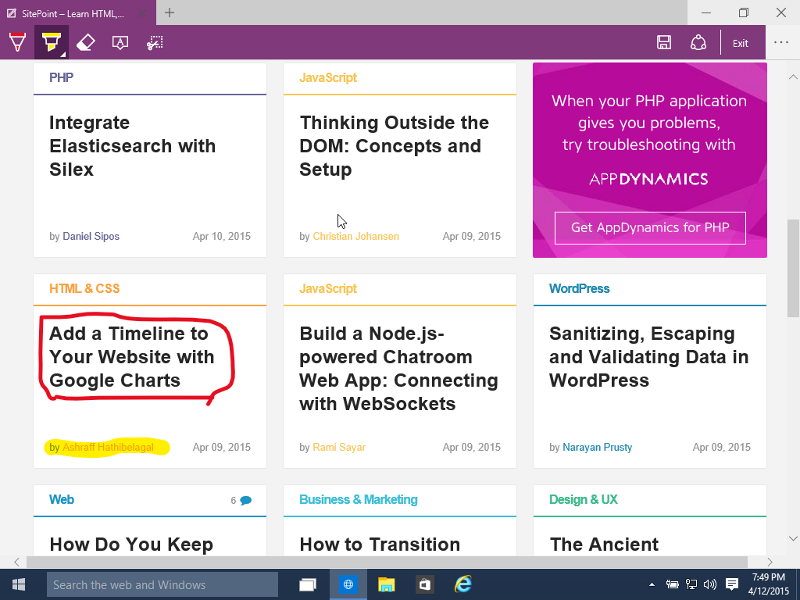 If it save and share without image (screenshot), how OneNote could sync the annotation and Web page? I can not find more information about Web Note feature. "this page" apparently referring to every page ion the internet. Read Mode - what does the need for such a feature tell you about too much of the Internet?